The Romans can be a little territorial when it comes to their cuisine, but the VyTA brand’s newly minted outpost - the third in the city - is hoping to tempt the city’s culinary chauvinists over to the gastronomic pleasures of the Lazio region. A 16th-century townhouse in ancient via Frattina has reimagined by local architect Daniela Colli into a three-storey cocoon of contrasting textures, geometric patterns, and muted sheens. 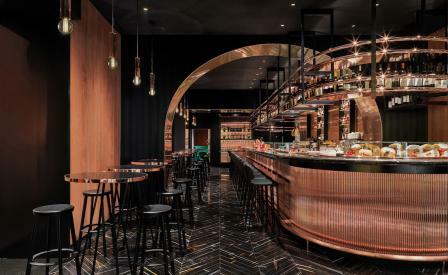 Lined with black marble, the ground floor wine-bar sets the scene with a 17-metre-long counter of polished copper surrounded by black leather stools. This adjoins a bijou food and wine library that Colli has finished with rose gold mirrors and green velvet. By contrast, the second floor dining room – a sequence of three separate salons – mixes black ceilings, textured concrete and orange velvet chairs with dark stained oak floors, pendant lighting, and a canopy of pentagonal mirrors.